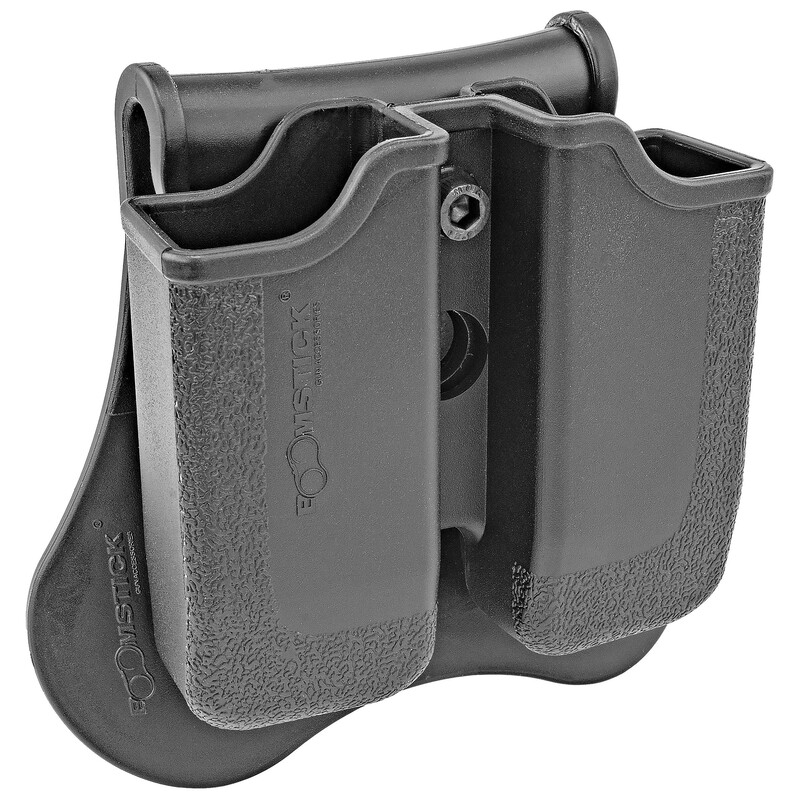 Get a reliable and easy-to-adjust magazine holding solution to accompany your Taurus 24/7. BOOMSTICK ACCESSORIES proudly brings you quality you can trust, with the industry-leading features you need! This 360 degree swivel equipped model includes the Allen key and comes in hard molded polymer. Military, Law-Enforcement, and Professional Grade. Period. Enjoy the security and reliability you need, with BOOMSTICK ACCESSORIES 360 degree swivel RIGHT HANDED, rotating, dual magazine pouch. Constructed from hard-molded polymer, and including the essentials like the Allen key and and silicone paddle for comfort and security, this model fits your TAURUS 24/7 magazines perfectly and enables you to easily carry the firepower you need in field. Designed for use in the toughest conditions, we’ve made sure all of our models comply with strict military and law enforcement specs. Built for a truly quick draw, and easy conceal-carry, this model easily clips onto any of your belts and is adjustable to allow you to easily reach your spare mags at any angle you choose. Simple, fool-proof construction tops it off. But to make it even better, you can also combine this model with our Drop Leg Platform and Full-Grip Belt Clips to give you even more options. And with all that, you also get INCREDIBLE VALUE and the security that comes with knowing that all BOOMSTICK ACCESSORIES products are designed and produced with the GUN OWNER in mind! Order with confidence, and enjoy your increased capabilities! FITS THE FOLLOWING MAGAZINE MODELS: Beretta Px4 - H&K P30 - H&K USP Compact (9/40) - Ruger SR9 - Steyr M Series - S&W Sigma - Taurus 24/7 - PT845 - PT840. Color is black. Overall dimensions are 4.53" x 1.81" x 4.21". A right-hand 360 degree swivel paddle holster made of durable Polymer that fits the following magazine models: Beretta Px4; H&K P30; H&K USP Compact (9/40); Ruger SR9; Steyr M Series; S&W Sigma; Taurus 24/7, PT845, PT840. Holster is fully adjustable with 360 degrees of rotation and can be removed from the paddle with included allen key and attached to other systems such as drop leg platforms and belt clips. Overall dimensions are 4.53" x 1.81" x 4.21".